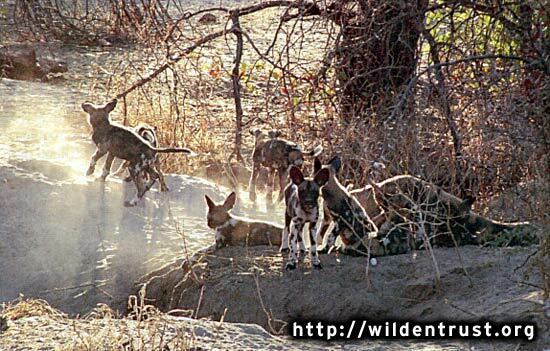 African 'Painted' Wild Dogs are on the verge of extinction! Once distributed widely across most of Africa, African Wild Dogs (Lycaon pictus), also know as the Painted Wolf and Cape Hunting Dog, have been persecuted by Man to the edge of extinction. The best estimate is that fewer than 5,000 African wild dogs now exist in the wild, and many packs no longer have viable breeding populations. They are dying out. Human encroachment has drastically reduced their range and their numbers. Because of land clearance, urbanization, and other factors, Africa's once-great herds of grazing animals are now restricted to scattered populations in parks and reserves. As their prey goes, so do the dogs, many being (often illegally) snared, shot, and poisoned by farmers. Your donations can help the dogs survive by helping to fund one of the research and conservation projects featured on this site. Many organisations work to understand and combat the problems that face these dogs, as well as promoting conservation and education programmes to change the attitudes of decades. Your donation IS needed. Please give as much as you can. African Wild Dogs have an ill-deserved reputation as aggressive, vicious killers. In fact, unlike almost any other predator, they live in extraordinary co-operation with one another, and this is nowhere better demonstrated than when feeding - the young and ill are given first access to food after a successful hunt. They are widely regarded as pests, and have been demonised for decades as ruthless and vicious animals. They've been poisoned, shot, and trapped in many areas. One of their most serious threats, though, is introduced diseases. Expanding human populations have brought the African Wild Dogs into frequent contact with domestic dogs, many of which carry canine distemper and rabies. These diseases are ravaging the wild packs. So I wanted to make a donation, but . . . Some time ago I decided to help the wild dogs survival by making a donation to one of the wild dog research and conservation programmes in Africa, and started looking at their sites so I could make my donation online. Unfortunately, though they asked for aid, it was sometimes very difficult to find the actual Donations page on these sites - and I ended up having to make a costly and complicated bank transfer instead. This site has been set up to help you avoid the problems I experienced by pointing you directly to the donations pages of the featured organisations. The menu on the left features several African Wild Dog conservation projects, each with its own page providing an outline about the project's aims, and a direct link to their online Donations page on their own site. Remember, these organisations spend most of their time undertaking research and conservation, not trying to understand how the internet works, so be patient and please persist if you have problems. If you can't 'get through' to one organisation, try one of the other ones. They really do need your donation. This site doesn't take or make any money. It doesn't cost any of the Wild Dog organisations any money. In fact, this site costs ME money - I cover all of the design and hosting costs privately. 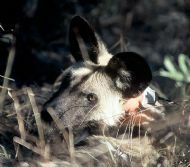 Its purpose is simply to make it easier for you to make a donation to one of the featured African Wild Dog research and conservation projects. For me, African Wild Dogs symbolise the often selfish, sometimes simply thoughtless, pressures that we exert on the environment and the other animals that we share this planet with. Unless we can be more responsible in our use of resources, then we, like the wild dogs and many other species, may be faced with extinction in the future. Colin Dunn, designer of this site.